Always start with a full tank of fuel for both the rider and the bike…….. Decide how far you want to ride. This can either be distance or area. How many checkpoints do you want to visit? How long do you want to be out for? All of this will help you decide your route and the Challenge level. Have a look at the outline map of the rally and study the legend. If you you want to visit Exmoor look at where the Manned Check Point (MCP) is in that area so you can plan a route to get half of your Unmanned Checkpoints on the way to MCP and half on the way back. The way the Unmanned Checkpoints are laid out generally has an interesting route between them. DONT JUST ON SAT NAV USE A MAP AS WELL. Or plot you proposed route on Google Maps or a similar Route Planning programme. This will give you an idea of the distance and time required for that route. 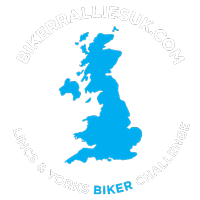 Plan you rest breaks and fuel stops, which are particularly important if you are not used to riding Rallies. and cut out the pages, cellotape them together) or plot you route on a GPS/Sat Nav system. I use the GPS as my back-up. If you are going to Exmoor and back fuel stops should not be an issue but more something to keep and eye on when you are riding and maintain a good range of fuel in your tank. Plan to get to the start in good time. Don’t be rushed. If you are riding for a Bronze award time is not too critical. For other awards you will want to set off as early as possible to get ahead of traffic and try to complete as much as possible in daylight. Don’t try riding and studying a map, you will end up in a hedge!! Stop and be safe, then look. After planning and making maps up I generally have a pretty good idea of where I am going in my mind which means a quick glance at a map now and then to confirm it. Time spent planning will not be wasted. Enjoy the ride and stunning views the day will offer.